I used 20gm of unknown 8 ply 100% Wool in dark blue, 25gm of Patons Fireside 8 ply 100% Wool in magenta (colour 3385) at approx 90 metres (105 yards) per 50gm ball and a scrap of anonymous 8 ply green 100% wool. 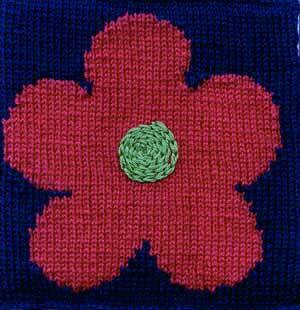 Embroider centre of flower using chain stitch. Sew in all loose ends, and block.